Gold. Just the word strikes up many images in the mind: gleaming bars in a vault, Old-49’ers in a rough-and-tumble boom town, a mine shaft deep in the earth or prospectors squatting beside a mountain stream oscillating their gold pans…. Not long ago, Tom, Randy and I developed a case of a highly-contagious and debilitating fever, gold fever. Because our vacations all coincided, we decided to spend the time prospecting. We packed up and, pans in hand, headed for the Mother Lode Country in California. Our plan consisted of searching areas of the Merced River and several forks of the American River. Gold has been prized from antiquity because of its scarceness and its inherent qualities. These inherent qualities, like its ability to be hammered paper-thin, its ability to be drawn into hair-thin wires, its weight–19 times heavier than water, and resistance to corrosion, have made gold the most sought-after metal throughout history. As far back as 4,000 B.C. the Egyptians were fashioning artifacts from gold. Gold is the first element mentioned in the Bible (Genesis 2: 10-12). Gold played an important role in the social and religious structure of the Inca and Aztec civilizations of Latin America. More recently, the gold rushes beginning in the early 19th century in the southeastern United States, followed by the great California rush of 1849, and by later strikes in the Rockies and Alaska, have kept gold fever smoldering to the present day. Part of the recurring interest in gold is the estimate that over 80 percent of all existing gold worldwide has yet to be discovered. 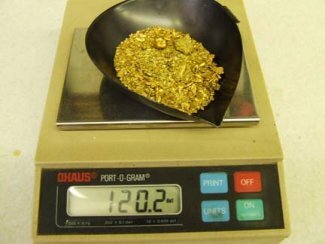 Because of its weight, a lot of gold takes up just a little space. For example, a cubic-foot of gold weighs more than half a ton and the gold would be worth over $7.5 million dollars! Knowing where to look for gold is probably responsible for 97 percent of the success that a prospector experiences. There are several good books that will get beginning prospectors started right. Dave McCracken’s Gold Mining in the 21st Century is probably the best. Two other books are; Gold Digger’s Atlas by Robert Neil Jonnson, and Gold! Gold! A Beginners Handbook And Recreational Guide: How To Prospect , by Joseph F . Petralia. The areas of greatest-known gold concentration in the United States are in the Sierra Nevada and Rocky Mountain ranges. The Klamath Range in Siskiyou County, California remains quite active for small-scale gold prospectors even to this day, especially the area surrounding Happy Camp. Sufficient concentrations of gold were also mined from 1830 to 1840 in the Appalachians, as well as the mountains of Vermont and New Hampshire, to warrant an interest, particularly at current price levels for gold. In 1986, California experienced a snow pack and spring runoff that were exceptional. The flow of the American River near Auburn, California became so great that colossal cement pilings and support slabs were slapped aside by the water as if they were empty cereal boxes. Even months after the high water, evidence of the tremendous force could still be seen on and around the American River Bridge near Auburn. The unusually high water turned many streams and rivers into raging torrents. This forced more gold out of hiding, and made for a tremendous prospecting season. Even so, reading the stream and bench placers properly can mean the difference between mediocre and memorable prospecting results. Another very large flood storm really tore up the area around Happy Camp in 1997. Basic prospecting gear can be purchased for less than a tank of gas, unless you are riding a motorcycle, and should last indefinitely. Useful tools for prospecting, some of which you may already have at home, include: a bucket, coffee can, garden trowel, tweezers, old spoon, whisk broom, pry bar, magnet, a sifting device and shovel. You will need one small vial or zip-lock baggie to store the gold you find, a crevice tool, and of course a gold pan. These last items may be purchased at a rock, prospecting shop or from the Internet. I suggest you purchase a high-impact plastic gold pan; it is lighter, very durable, and the black, blue or green color allows greater contrast of the gold against the darker background. 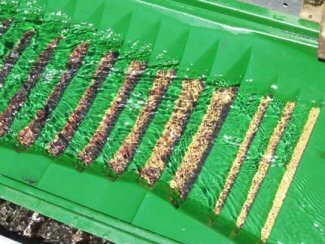 Most plastic pans have traps and riffles molded into them to aid in gold recovery. The mornings and evenings of our prospecting trip were cool and the warmth of the campfire felt comforting; but the days, and particularly the afternoons, were blistering-hot. Because we were in close proximity to water, coping with the heat was relatively easy. Not only did we jump in every half hour or so to cool off, but we soon began prospecting entirely within the river. It is amazing how much gold you can find just swimming around with mask and snorkel, while fanning light gravel from cracks in the bedrock! 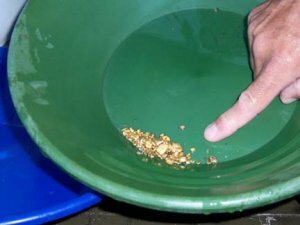 During the first several days of our gold trip, one participant developed such an increasingly acute gold fever; that in an effort to not waste a moment on creature comforts, he began panning in mid-stream while almost completely submerged. All prospectors in our group soon were diving down and bringing gravel up from the bottom of the river. We sat around the campfire at night just imagining how much more gold we would have recovered had we brought along a suction dredge on our venture. It was a great trip! Prospecting is a pleasant activity for me. I often take an afternoon or weekend, and enjoy the gold I find as well as the prospecting. Gold prospecting can be done on a solo trip, a family trip or with a large group. People of all ages can prospect for gold and enjoy the search. You will enjoy prospecting, and the exercise in the out-of -doors is just an added plus.